Previous reservoir sedimentation models have ignored two key factors for large spatial and temporal modeling of multiple reservoirs: trapping by upstream dams and decreasing sediment trapping as reservoirs fill. We developed a spreadsheet-based model that incorporates both factors. Using California as a case study, we used measured sedimentation rates to estimate sediment yields for distinct geomorphic regions and applied those rates to unmeasured reservoirs by region. Statewide reservoirs have likely filled with 2.1 billion m3 of sediment to date, decreasing total reservoir capacity by 4.5%. About 200 reservoirs have likely lost more than half their initial capacity to sedimentation. 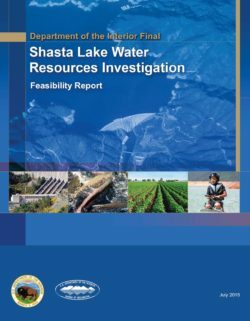 agencies’ evaluation of the potential enlargement of Shasta Dam and Reservoir to (1) improve anadromous fish survival in the upper Sacramento River, (2) increase water supply reliability in the Central Valley of California, and (3) address related water resource problems, needs, and opportunities. This Final Feasibility Report presents the results of planning, engineering, environmental, social, economic, and financial studies and potential benefits and effects of alternative plans, and is a companion document to the Final Environmental Impact Statement (EIS), published under separate cover. This Final Feasibility Report, along with the Final EIS, will be used by the U.S. Congress to determine the type and extent of Federal interest in enlarging Shasta Dam and Reservoir. The SLWRI is a feasibility study that was authorized by Congress in 1980 in Public Law 96-375 and is being conducted by Reclamation, in coordination with cooperating agencies, other resource agencies, stakeholders, and the public. The SLWRI is being conducted consistent with the 1983 U.S. Water Resources Council Economic and Environmental Principles and Guidelines for Water and Related Land Resources Implementation Studies (P&G), Reclamation directives and standards, National Environmental Policy Act (NEPA), and other pertinent Federal, State of California (State), and local laws and policies. Programmatic Record of Decision (ROD). Preliminary studies in support of the CALFED PEIS/R considered more than 50 surface water storage sites throughout California and recommended more detailed study of the five sites identified in the CALFED Programmatic ROD. The Final EIS, accompanying this Final Feasibility Report, tiers to the CALFED PEIS/R. 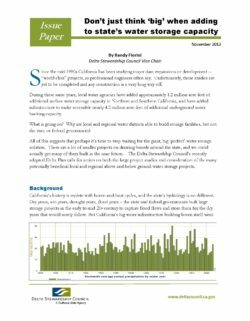 This Issue Paper, authored by DSC Vice-Chair Randy Fiorini, is entitled, “Don’t Just Think ‘Big’ When Adding to State’s Water Storage Capacity.” The paper discusses the successes of many local public water agencies in constructing small storage projects, and suggests the State consider small, as well as large scale storage projects, to address California’s water storage needs. The California Water Commission should conduct a statewide survey of public water agencies to determine locations that have been considered locally or regionally for water storage but have not been pursued. To ensure public water agency participation the California Water Commission should partner with the Association of California Water Agencies to prepare for and conduct the survey and produce and inventory list. Once a statewide survey of possible storage locations is complete and a comprehensive list of locations has been identified, the Department of Water Resources and the California Water Commission should evaluate and identify which locations with local support have a public benefit. Surface water reservoirs provide water supply and flood management benefits by capturing water when available and storing it for use when needed. Surface reservoirs are commonly operated more for seasonal or short-term inter-annual needs. Groundwater aquifers generally provide longer-term storage and a source of water and seasonal storage in areas where surface water is limited. 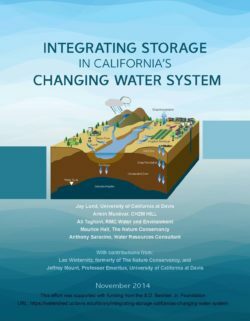 This paper reviews the benefits and challenges of water storage in California’s evolving water system, and provides some quantitative insights from an integrated analysis of this system. Water storage should not be viewed as isolated projects. For today’s water management objectives and conditions, surface water and groundwater storage should be considered and analyzed as parts of larger systems or portfolios of actions that include a wide variety of water sources, types and locations of storage, conveyance alternatives, and managing all forms of water demands. Such an integrated, multi-benefit perspective and analysis is a fundamental departure from most ongoing policy discussions and project analyses. 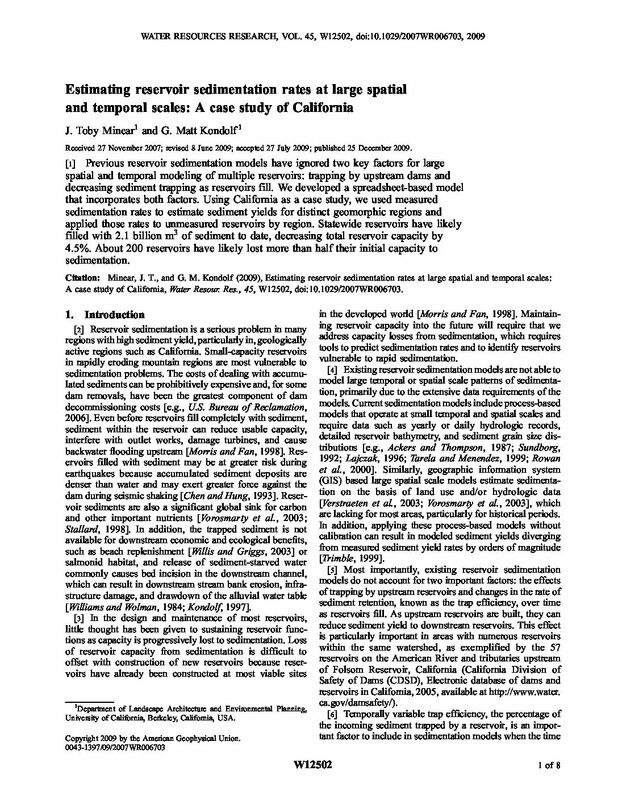 The pilot study described in this paper focused on water storage and concludes that ability to utilize additional water storage in California varies greatly with its location, the availability of water conveyance capacity, and operation of the system to integrate surface, groundwater, and conveyance facilities. At most, California’s large-scale water system could utilize up to 5-6 million acre-feet of additional surface and groundwater storage capacity, and probably no more, which would likely provide 50-150 taf/year of additional water delivery for each million acre foot of additional storage capacity alone. The water supply and environmental performance of additional storage capacity is greatest when surface and groundwater storage are operated together. The benefits, and likely cost-effectiveness, of coordinating surface and groundwater storage and conveyance operations greatly surpass the benefits of expanding storage capacity alone, greatly expanding water delivery increases to as much as 200 taf/maf of additional storage capacity. Because we did not quantify and compare the economic value and costs of water supply and other benefits of expanding storage capacity, we cannot yet say if particular expansions would be economically justified. Similarly, because we did not comprehensively analyze the environmental impacts of expanding storage capacity or specific storage projects, we cannot yet say if particular expansions would be environmentally justified. Further, this study does not consider reoperation of existing facilities, water demand management, changes in prioritization of water uses or rights, or other policy or regulatory actions that might change the ability to supply water demands using existing water storage capabilities. California’s Sustainable Groundwater Management Act (SGMA), passed in 2014, recognizes and addresses connections between surface water and groundwater. The statute is California’s first statewide law to explicitly reflect the fact that surface water and groundwater are frequently interconnected and that groundwater management can impact groundwater-dependent ecosystems, surface water flows, and the beneficial uses of those flows. As such, SGMA partially remedies the historically problematic practice of treating groundwater and surface water as legally distinct resources. SGMA requires groundwater sustainability agencies (GSAs) to manage groundwater to avoid six undesirable results, including significant and unreasonable adverse impacts on beneficial uses of surface water. While this aspect of SGMA is clearly important, significant uncertainties exist regarding how GSAs will actually define and achieve this goal. Addressing SGMA’s requirements for groundwater-surface water interactions will be difficult. Defining the issues at stake in any given basin, let alone successfully balancing the range of uncertainties and potentially conficting interests, will pose challenges for many GSAs. No clear, pre-defned formula exists to guide GSAs in determining what significant and unreasonable depletions of interconnected surface water will be, or whether planned actions will sufficiently avoid them. Yet they are required to do so. Many GSAs will face pressure to aggressively address impacts on surface water in their basin. Many will face equal or greater pressure not to draw the line. Nevertheless, it will fall to the GSAs to make a determination, and to defend it in their groundwater sustainability plans (GSPs). Therefore, GSAs will likely take on some level of risk—of successful political opposition to their GSP, of successful legal challenges to their GSP, of their GSP performing ineffectively, or of all of these outcomes. Given the aggressive timeline inherent to SGMA, addressing this risk early will be crucial for preserving management options. Challenges and risk are not the whole story, however. The process of addressing groundwater-surface water interactions also ofders GSAs an opportunity to help communities and other stakeholders resolve, or avoid, difficult conflicts, and to do so in lasting ways. While California law has only recently begun to seriously address conflicts between surface and groundwater uses, those conflicts have been occurring for decades, and in some places for over a century. SGMA, in other words, did not create conflict between groundwater pumping and beneficial uses of surface water; instead it created an opportunity—as well as an obligation—to respond to those challenges. Embracing that opportunity will not be easy, but GSAs that take SGMA as an opportunity to resolve longstanding issues can do lasting good. 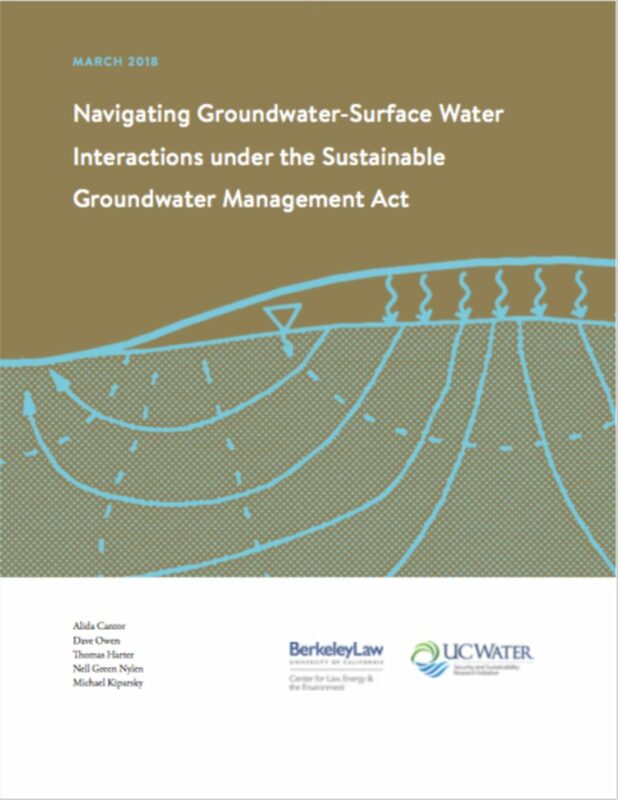 The research presented here examines some of the legal and institutional questions that will inevitably arise as GSAs seek to address groundwater-surface water interactions under SGMA. The core goal of this report is to help parties identify and address these questions, and ultimately to let GSAs and stakeholders manage groundwater-surface water interactions proactively and effectively.